The genius way Matty J and Laura Byrne initially hid their pregnancy. The genius way Laura Byrne and Matty J initially hid their pregnancy news from fans. 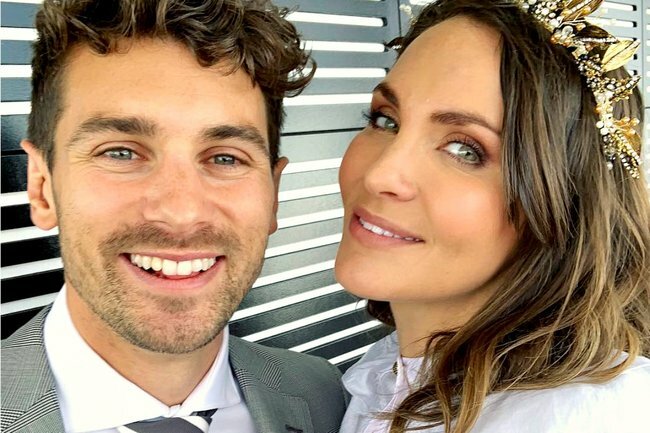 Former Bachelor stars Matty J and Laura Byrne have announced they’re expecting a Bachie baby, and we are obviously OVERJOYED for them. But there is something we simply must talk about – and it’s the very, very sneaky way they managed to hide the pregnancy from nosy fans (i.e. us). Speaking to The Daily Telegraph, the couple said they chose to share their baby news at the 15 week mark because Laura had already begun to show, but ideally they would have kept her pregnancy on the down-low for a bit longer. However, a casual scroll through Laura’s Instagram shows multiple posts of her sipping on a wine or cider (which was a part of her brand deal with Rekorderlig Cider), with the earliest of these photos dating back to November 2, which puts her at roughly week nine of her pregnancy. And if there’s a sure-fire way to throw fans off the scent of being ‘with-child,’ it’s the presence of a rogue alcoholic beverage. Despite this, if you look very closely, for the most part – the drinks are have remained unsipped. We weren’t the only ones to notice either, with several fans making note of her cheeky use of props. “Now I’m seeing this was probably a cheeky empty bottle! Congratulations guys ❤️ it’s going to be one bloody good looking baby!” wrote one Instagram user. “The old hold the drink, no one will know I’m pregnant trick! You fooled me!” shared another. “Was this you trying to get everyone off the pregnancy scent?” wrote another fan, followed by a laughing with tears and applause emoji. Did you notice Laura Bryne ‘drinking’ on her Instagram posts? Tell us in a comment below.